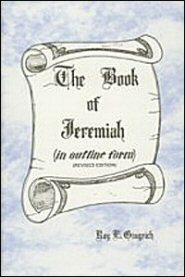 Jeremiah is the longest of the five major prophetical books of the Old Testament. In addition to being lengthy, the book’s message is mostly gloomy, is non-chronological in its development and is difficult of understanding without a thorough knowledge of its historical background. For these reasons, Jeremiah is often neglected by students of the Old Testament. However, this neglect is unfortunate, for Jeremiah’s prophecies have value to the people of God of every age. God’s judgments upon Judah’s sins and rebellion, as delineated in these prophecies remind us that God’s judgments upon sin and rebellion are universal and perennial and that our sin and our rebellion will be judged unless we repent. Hence this masterful treatise on the moral principles of God is highly applicable to people of our day. This commentary by Dr. Gingrich on Jeremiah is of the same high quality as that of his previous publications. His treatment of introductory and background matter is very helpful. His exegesis of the text is terse, profound, and thorough, but his explanations of the text are written is a simple and easily readable form.